Target Travel have got a new timetable up for the 46/47 route. They have those all the way along Torr Lane for the 39/39A. 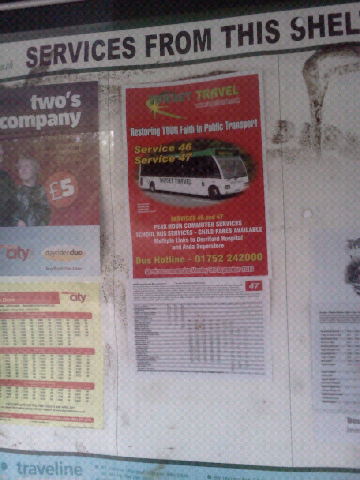 The red backdrop with the Optare in front really stands out on the timetable board. I imagine people who walk along Torr Lane regularly will have been largly un-aware of the bus route previously. they need to get the destination blinds sorted!! i actually thought it was a legal requirement?? The destination blind on at least one of the Optares is useless and scruffy bits of paper seem to be the norm most of the time.